President Donald Trump met with House Republicans at the Capitol Tuesday. House Republicans leaving a meeting on with President Donald Trump Tuesday evening said he endorsed the more moderate of two immigration bills being voted on Thursday, although the White House was less definitive in its characterization of Trump’s support. The president attended the strategy session with House Republicans as lawmakers struggle to respond to the national uproar over the administration's policy causing family separations at the border. Trump told the group that he had seen images associated with family separations and told Republicans that they needed to "take care" of it in legislation, according to a source in the room. Ivanka Trump showed her father images of the detained children and encouraged him to end the policy, saying the photos were painful to see. “He endorsed both House immigration bills that build the wall, close legal loopholes, cancel the visa lottery, curb chain migration, and solve the border crisis and family separation issue by allowing for family detention and removal. He told the members, ‘I’m with you 100%,” White House deputy spokesman Raj Shah said in a statement following the meeting. 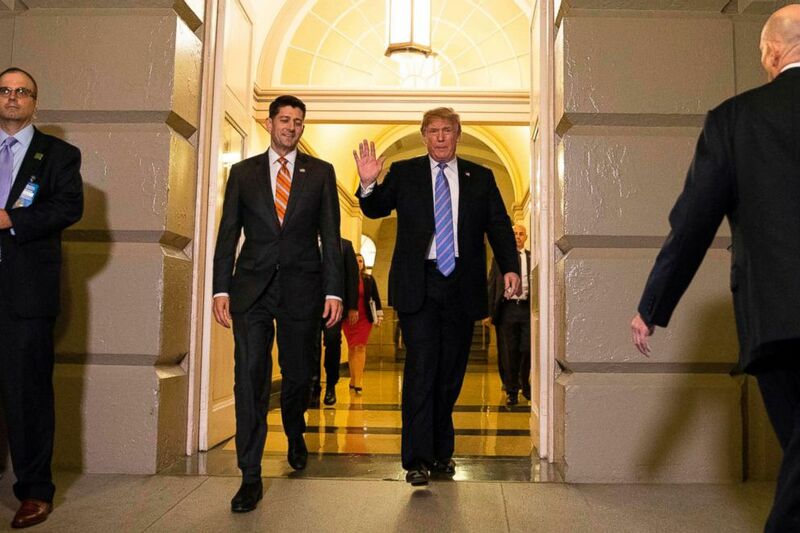 (Alex Edelman/AFP/Getty Images) President Donald Trump, accompanied by House Speaker Paul Ryan, R-WI, arrive for a meeting with Republican members of Congress at the Capitol in Washington, on June 19, 2018. But House Republicans leaving the meeting said they came away thinking he was endorsing a compromise bill, crafted by leadership in consultation with both moderate and conservative members of the House Republican conference. “The compromise bill is what I gathered. He didn't specify which bill but it was the contours that were laid out in the compromise bill,” Rep. Ryan Costello, R-Pa., told reporters after the meeting. Republican leadership crafted the compromise bill to placate moderates who threatened to force a vote on legal status for recipients of the Deferred Action for Childhood Arrivals (DACA) executive action under President Obama. The measure would provide $25 billion in border wall funding, eliminate several visa programs while restructuring others, and provide a pathway for six-year "indefinitely renewable" legal status for "Dreamers" who could later apply for citizenship. It is also expected to include a provision to prevent the government from separating young children from parents and guardians while in government custody. A more conservative alternative to the compromise bill, written by McCaul and House Judiciary Committee Chairman Bob Goodlatte, the Securing America’s Future Act, provides a pathway to legal status for Dreamers while limiting legal immigration levels. It isn't expected to pass the House with Republican votes given Democrats' opposition, as well as concerns from some moderates. Even if Trump didn’t specify which of the two bills he preferred, House Republican Whip Steve Scalise, R-La., indicated that the president endorsed the policies that comprise the more moderate bill. “President Trump did a great job of explaining to our conference why he wants to see a bill get through the House that actually addresses the problem of border security, making sure the money's there to build the wall, making sure that parents are reunited with families, making sure that we solve the DACA problem, closing interior loopholes, ending catch and release,” Scalise said. The president declined to answer shouted questions about the new practice as he entered and exited the Capitol but did make a statement about the immigration system in general. "The system has been broken for many years, the immigration system. It's been a really bad, bad system, probably the worst anywhere in the world. We're going to try to see if we can fix it," he said as he arrived at House Speaker Paul Ryan's office. The House is slated to vote on both the compromise bill and the Goodlatte/McCaul bill Thursday. 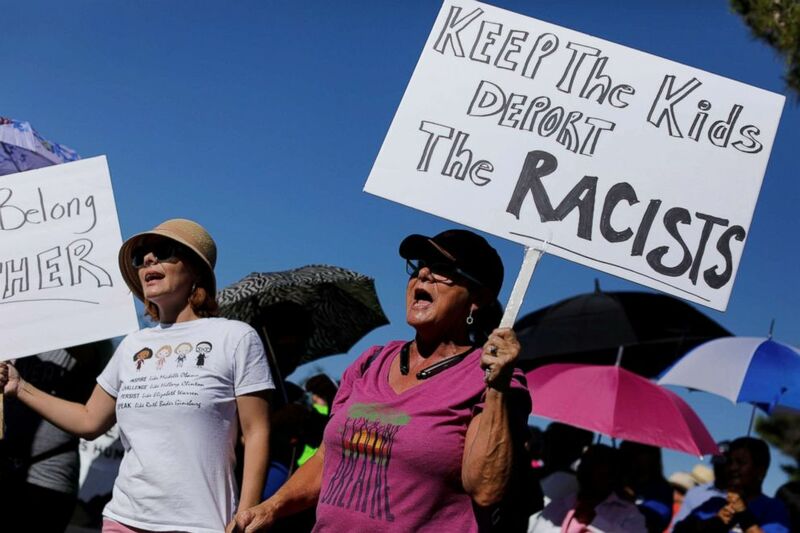 (Mike Blake/Reuters) People protest against the policy of separating immigrant families suspected of illegal entry, in El Paso, Texas, June 19, 2018. The more conservative bill would require the Department of Homeland Security to house families together while parents go through criminal proceedings for the misdemeanor of first-time illegal border crossing - a change from current practice requiring the Department of Justice to take criminal custody during criminal proceedings, thus leading to family separation. The legislation is not finalized but an updated version was expected to have been circulated among lawmakers in advance of the conference meeting with the president. Republican leaders were gauging support for the compromise bill, in a process known as whipping the vote, following their meeting with the president. While the political and policy conversation has revolved around the issue of family separation in recent days, lawmakers exiting the meeting said the president did not focus on the new practice of removing children from the custody of their parents while the parents await prosecution. “It was not a situation where there was a lot of focus on the separate family separation issue,” Costello said. In fact, some sources indicated it was more of Trump’s typical stream-of-consciousness style addresses, in which he touched on issues as varied as trade, North Korea, and the recent Republican congressional primary in South Carolina in which Republican Mark Sanford was ousted. Trump’s supportive remarks about the GOP compromise bill cap off a half-week of confusing, contradictory statements. Earlier Tuesday, Trump announced that he would make his own changes to the House immigration bill after he reviews the emerging text. His surprise comments come after a whirlwind Friday when Trump told reporters he wouldn't support the GOP compromise bill, only to be contradicted by the White House in a statement nine hours later pledging support for either option. 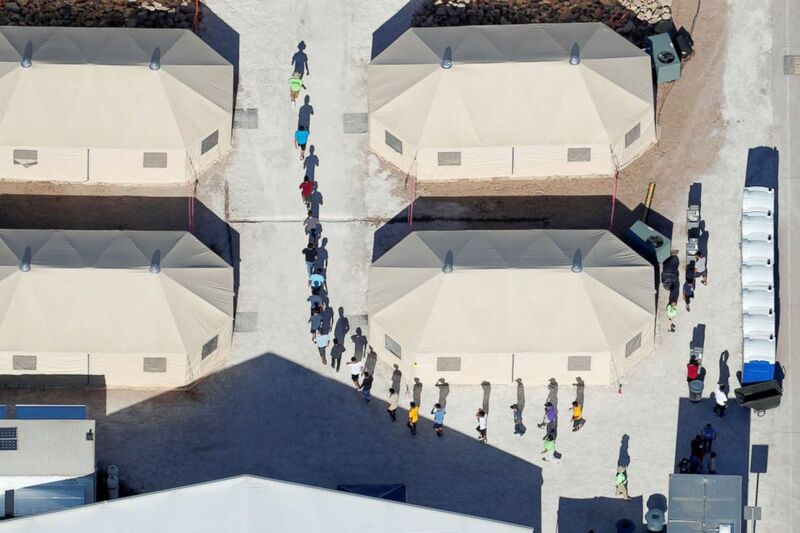 (Mike Blake/Reuters) Immigrant children are shown walking in single file between tents in their compound next to the Mexican border in Tornillo, Texas, June 18, 2018. ABC News' Ben Siegel contributed to this report.